Playwright and writer M. Safeer who recently attended, Theatre Treffen 2016, renowned theatre festival in Germany is to share his experience about the “present day theatre in Berlin and My Experience ” on June 21 at 5.00 pm at the Goethe-Institute in Colombo (German Cultural Centre). The discussion will be coordinated by Dr. Saumya Liyanage. Safeer has attended many theatre festival, seminars, conferences and workshops in many cities in Germany and has contributed immensely to the local theatre field through his experience. Theatre Treffen is one of the world’s largest theatre festivals where theatre enthusiasts and professionals get opportunities to meet and discuss with the organizers, the directors who performed, artists and government officials about contemporary theatre and its future. 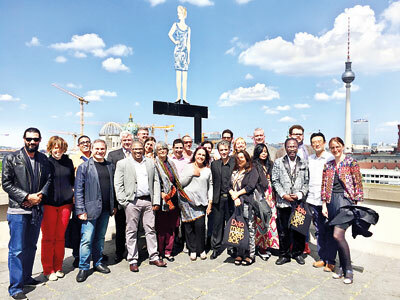 Representatives from 22 countries were invited by the Foreign Office of the German Democratic Republic which included professors, theatre directors, festival directors, theatre critics and journalists. This trip to Germany was organized and supported by German Embassy in Sri Lanka and German Cultural Center in Colombo.